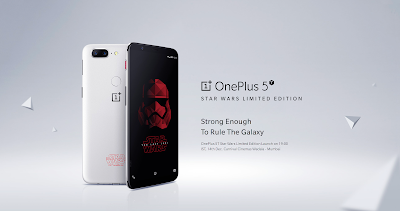 The global, premium smartphone company, OnePlus is ready to launch a limited-edition variant of its hugely popular OnePlus 5T exclusively for die-hard OnePlus and Star Wars fans in India. The OnePlus 5T Star Wars Limited Edition smartphone will be unveiled at the launch event at IMAX Wadala in Mumbai on December 14 at 7 PM. OnePlus and Star Wars fans in India can watch the launch event live by purchasing the ticket from Paytm tomorrow at 10 am for Rs. 999 only. With the purchase of every ticket, OnePlus fans will be the first to experience the latest device in person and along with that, get complimentary snacks and exclusive OnePlus Star Wars merchandise including a t-shirt worth Rs. 999 and laptop bag worth Rs. 1,999 and an exclusive grand surprise! OnePlus 5T Star Wars Limited Edition is the latest iteration of OnePlus’ premium flagship- OnePlus 5T. Limited tickets will be available for sale tomorrow.